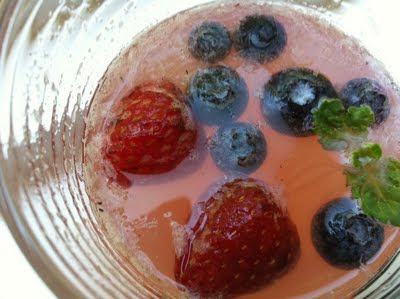 What would Recipe Monday on the 4th of July be without something red, white, and blue and semi-patriotic? Well, it would be just fine, but knowing how obsessed I am with eating your colors, I just couldn't pass up this opportunity. When I think of Independence Day, words that come to mind are: fireworks, barbecue, pool party, day off, and beer. Now, when transitioning to a GF diet, I know there are many who lament the loss of the last word on that list. But nowadays, they sell a variety of beers made from alternative grains that are gluten-free and some of them are actually quite tasty. Now, I very rarely drink, but when I do, it's nice to know that there are options for me. And as always with the recipes I share on The Canary Files, I strive to broaden people's conception of their food and drink and I hope to present them with options that perhaps they had never thought of. That being said, today's recipe is inspired by the shandy, a drink that traditionally consists of a citrus juice or soda mixed with beer. There are a plethora of variations on it, and depending on which country you're drinking it in, some very interesting names to match. In France, it's called a "Panache," in Germany, a "Radler," in Spain, a "Champu," and if you happen to be in Texas, a "Gringo Honeymoon." 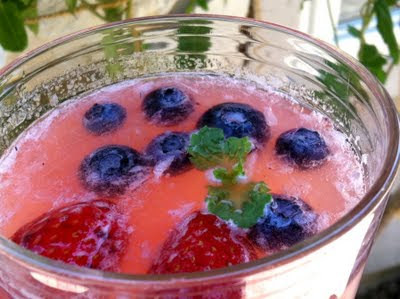 I wanted to come up with a refreshing and lightly alcoholic libation that would be appropriate for drinking at a barbecue, sipping by the pool, or enjoying under the glow and thunder of fireworks. 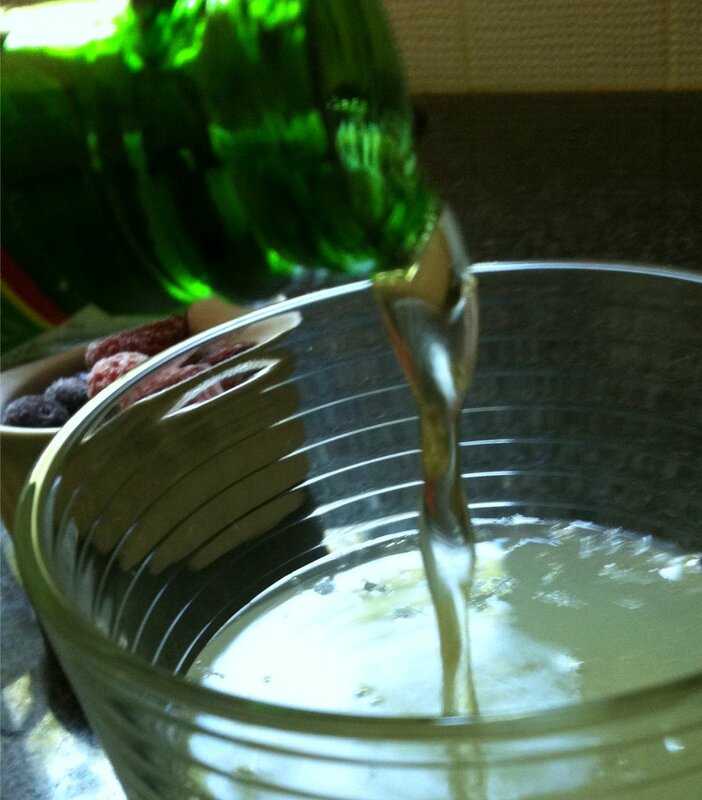 And if you prefer not to drink alcohol (or you're a youngin'), it's really easy and still delicious to make this drink non-alcoholic. So simple and so enjoyable. And while today's recipe calls for blue and red berries in honor of Independence Day, this drink would also be delicious with peaches, mangoes, cantaloupe, or even a bruised lemongrass stalk. Have fun and let yourself be creative and artistic with this effervescent cocktail. Every day can be worth celebrating if we are brave with our happiness. Courageously share your life and your love with others. You are as free as you want to be. 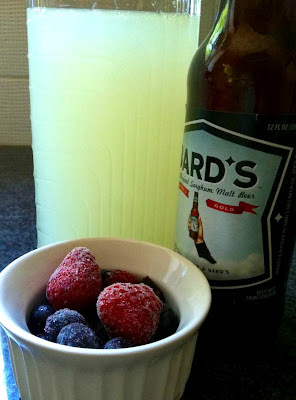 I saw some beer shandy at the store today and thought about this recipe. I would've enjoyed this drink last Monday. I had to settle by drinking some cooler chilled organic wild cherry juice and sparkling water with a squeeze of lemon. I'm sure Dad would like this drink. I wonder if San Mig has any varieties that are GF.